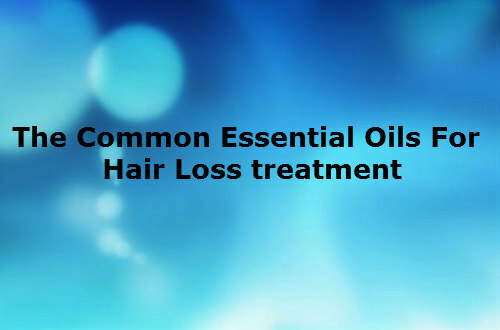 Essential oils help the hair to grow stronger and healthier. It supports regrowth in people who experience loss of hair. They are used as ingredients in hair care potions. Essential oils include lavender oil, rosemary oil, chamomile oil and Tea Tree oil in shampoos and conditioners for good reason. These oils can enrich the health of the scalp and hair follicles. They are vitally the ‘active ingredients’ in your potions. We must choose one or more of the essential oils and add them at the recommended levels to the normal oil. Then after applying we must gently massage the mixture into the scalp every day. Doctors suggest wrapping the scalp with a warm or a moist towel to enhance absorption by opening the pores. This can be done before going to bed and cover the pillows and sheets from the oil. As far as dilution are concerned few drops are recommended to be mixed in eight to ten ounces of normal oil. This is an average varying constituent of mixture and it is subjected to vary. Below is a list of many essential oils used in hair care to properly manage the hair. It is rich in carotenes and other antioxidants. This oil is an exceptional oil to stimulate and regenerate the follicle cells. To support hair growth for men with hair loss due to male pattern baldness a vitamin A supplement called tretinoin found in the Retin medicine is used with Rogain to treat it. It is a supercritical extract of carrot root dispersed in Jojoba oil. Ranking foremost as the most beneficial oils it supports healthy hair growth for users of all ages. It is known widely in the skin treatments for strengthening pallid and dull skin. Similarly it has the same effects for hair follicles. It also especially useful when detoxification is needed. It promotes hair growth for people particularly affected by environmental toxins like smokes from factories and vehicles and office environments etc. For those experiencing less than optimal range of hair growth or hair loss resulting from bacterial or infections and other immune system deficiencies this oil is used as one of the essential oils in a blend successfully. This oil is dispersed in Jojoba and Grapeseed. It is used in aromatherapy mostly as an effective agent to reduce inflammatory disorders. Loss of hair is occasionally linked to inflammations on the scalp and follicles while hair loss is even associated with an overheated scalp. German Chamomile has both anti-inflammatory and cooling properties with a pleasing and sweet herbaceous aroma. It helps in soothing the inflammations and cures the hair related problems by imparting a pleasant odour. Stable hormonal balance is vital for both genders when keeping in mind the health of hair. Clary Sage is known to equalise the estrogen levels both in the skin and scalp and can particularly support mature women. It is an antiseptic and a very potential antioxidant. It can increase the blood circulation in the hair follicles and may provide support for stimulating growth of new hairs. For stimulation of blood circulation on the scalp black pepper may be used only in very small amounts due to skin sensitivity. It is mixed in potions to increase the blood circulation and strength of the capillaries. Good blood circulation is important to the hair follicles for an optimal hair growth. Nowadays many new regimens for treating hair loss like Ginko and other herbs to increase the blood circulation in the scalp is readily available in the market. It supports the regeneration of all soft tissues of the body. This oil is found in blends to treat both skin and to heal wounds. Similarly it regenerates the scalp tissues also and is very important as some doctors suggest it to use on the aging scalp to resemble scar tissues. It has excellent anti-inflammatory properties and can be used to improve the blood circulation. It is available in hair potions of all types of hair and scalp conditions. It balances, soothes, regenerates and has anti-inflammatory and antibacterial properties. It is the most commonly used oil for reducing stress. It naturally balances the scalp oils. It is very useful when the overproduction of sebum oils clog the skin pores and hair follicles of the scalp. It is a natural and a gentle antiseptic known commonly for its regenerative purposes. It is the premier hair growth enhancing essential oils. It is available in many preparations for hair and scalp. It increases the metabolism of the cells and also stimulates healthy hair growth. The Verbenone type is used if the regenerative properties are desired. It is successfully used in the treatment of alopecia areata. It is regarded for hair growth. It has stimulating properties with hormone balancing properties of Clary Sage. It balances scalp oils and is used in blends to reduce scars and generated skin. It should not be used on children and pregnant ladies. This amazing oil enhances the health of follicles and scalp and also all imbalances.It is rich in nutritions, antioxidants and regenerative properties. It has high amount of carotene which will tend to keep the scalp red colored red color for a while after applying. It prevents UV damages, that reduces energy in hair follicles. It is reduces stress. It has been used to strengthen the thickness the shaft of the hair to grow naturally thicker hair. It has stabilizing effect on the oil production of scalp and reduces split ends.